Up until this point in the narrative the episodes and events have primarily involved the Apostle Peter. Now the focus will shift from Peter and onto others, the first of whom is Stephen. His time in the narrative is short, but there is quite a bit that we can learn from him. I remarked earlier that the events recorded in the Bible are not necessarily arranged chronologically, but are instead arranged according to the purpose of the author. Here we have another episode that does not necessarily follow chronologically from the previous events. The only clue we are given as to where it falls chronologically in the narrative is the phrase in v. 1, “Now at that time while the disciples were increasing in number…” Thus it is possible for these events to have occurred at any point after the bestowing of the Holy Spirit in chapter 2. What transpired was a complaint from the Hellenistic Jews (Jews who had adopted the Greek language and probably some of the culture as well) against the native Hebrews regarding their widows being overlooked in the daily distribution of food. This was no small matter since in those days these widows likely would have been dependent on others for their daily needs. The lesson here is that there are a variety of ministries within the Church and none is inferior to the other and each is necessary. The Twelve recognized that their place was in the teaching and ministry of the word of God. * They had each spent time with Jesus while he was on Earth and had heard him teach regularly for 3 years. They had been chosen and prepared by God for the positions they were in and they recognized that they should not neglect the duties and responsibilities of their positions (e.g. prayer and “ministry” of the word). However they also recognized that ensuring all the widows were provided and received food, so they decided to appoint others to be in charge of this task. The statement found approval with the whole congregation; and they chose Stephen, a man full of faith and of the Holy Spirit, and Philip, Prochorus, Nicanor, Timon, Parmenas and Nicolas, a proselyte from Antioch. 6 And these they brought before the apostles; and after praying, they laid their hands on them. Remember earlier that the requirements for this position were to be a man “of good reputation, full of the Spirit and of wisdom,” so all these men listed here had to have met that requirement. Thus mentioning that Stephen was “a man full of faith and of the Holy Spirit” seems unnecessary and redundant. However, as we will see shortly, this is done in order to place special emphasis on Stephen and to seemingly put him above the others in terms of being full of the Spirit. 7 The word of God kept on spreading; and the number of the disciples continued to increase greatly in Jerusalem, and a great many of the priests were becoming obedient to the faith. Before we move on to Stephen however it is again mentioned that the disciples, or the Christian community, continued to increase in Jerusalem. What is significant about it this time however is that the Jewish priests were also becoming part of the Christian community. 8 And Stephen, full of grace and power, was performing great wonders and signs among the people. 9 But some men from what was called the Synagogue of the Freedmen, including both Cyrenians and Alexandrians, and some from Cilicia and Asia, rose up and argued with Stephen. 10 But they were unable to cope with the wisdom and the Spirit with which he was speaking. 11 Then they secretly induced men to say, “We have heard him speak blasphemous words against Moses and against God.” 12 And they stirred up the people, the elders and the scribes, and they came up to him and dragged him away and brought him before the Council. 13 They put forward false witnesses who said, “This man incessantly speaks against this holy place and the Law; 14 for we have heard him say that this Nazarene, Jesus, will destroy this place and alter the customs which Moses handed down to us.” 15 And fixing their gaze on him, all who were sitting in the Council saw his face like the face of an angel. The account of Stephen here is remarkably similar to what has been recorded of Peter and the other Apostles. Like the Apostles he performed miracles among the people (v. 8); was then opposed by some of the Jews (v. 9); those who opposed him could not answer him (v. 10); so they raise up false witnesses against him and get the Jewish leaders involved (vv. 11-14). However they all recognize that there is a certain power at work in him that is quite formidable (v. 15). This is not the end of Stephen in the narrative, but rather just his introduction. His story continues in the follow chapter, which will be discussed next time. 8 And Stephen, full of grace and power, was performing great wonders and [h]signs among the people. 9 But some men from what was called the Synagogue of the Freedmen, including both Cyrenians and Alexandrians, and some from Cilicia and [i]Asia, rose up and argued with Stephen. 10 But they were unable to cope with the wisdom and the Spirit with which he was speaking. 11 Then they secretly induced men to say, “We have heard him speak blasphemous words against Moses and against God.” 12 And they stirred up the people, the elders and the scribes, and they came up to him and dragged him away and brought him [j]before the [k]Council. 13 They put forward false witnesses who said, “This man incessantly speaks against this holy place and the Law; 14 for we have heard him say that this Nazarene, Jesus, will destroy this place and alter the customs which Moses handed down to us.” 15 And fixing their gaze on him, all who were sitting in the [l]Council saw his face like the face of an angel. This entry was posted in Acts of the Apostles, Bible and tagged Acts, Acts of the Apostles, Bible, book of Acts, Christianity, God, Holy Spirit, Jesus, religion, theology on September 16, 2013 by SRQTom. 12At the hands of the apostles many signs and wonders were taking place among the people; and they were all with one accord in Solomon’s portico. 13 But none of the rest dared to associate with them; however, the people held them in high esteem. 14 And all the more believers in the Lord, multitudes of men and women, were constantly added to their number, 15 to such an extent that they even carried the sick out into the streets and laid them on cots and pallets, so that when Peter came by at least his shadow might fall on any one of them. 16 Also the people from the cities in the vicinity of Jerusalem were coming together, bringing people who were sick or afflicted with unclean spirits, and they were all being healed. 17 But the high priest rose up, along with all his associates (that is the sect of the Sadducees), and they were filled with jealousy. 18 They laid hands on the apostles and put them in a public jail. 19 But during the night an angel of the Lord opened the gates of the prison, and taking them out he said, 20 “Go, stand and speak to the people in the temple the whole message of this Life.” 21 Upon hearing this, they entered into the temple about daybreak and began to teach. The Jewish rulers did not expect an angel of the Lord to free their prisoners, so they were confused when they were not found in the prison, but instead in the temple teaching the people the very things that the Jewish rulers had instructed them not to teach. Now when the high priest and his associates came, they called the Council together, even all the Senate of the sons of Israel, and sent orders to the prison house for them to be brought. 22 But the officers who came did not find them in the prison; and they returned and reported back, 23 saying, “We found the prison house locked quite securely and the guards standing at the doors; but when we had opened up, we found no one inside.” 24 Now when the captain of the temple guard and the chief priests heard these words, they were greatly perplexed about them as to what would come of this. 25 But someone came and reported to them, “The men whom you put in prison are standing in the temple and teaching the people!” 26 Then the captain went along with the officers and proceeded to bring them back without violence (for they were afraid of the people, that they might be stoned). 33 But when they heard this, they were cut to the quick and intended to kill them. Regardless of his intentions, Gamaliel offers good advice to the council. At this point the newly formed Church is too large and causing too much of a stir for the Jewish leaders to simply execute the Apostles; doing so would anger the people and likely cause a riot. But the Apostles are undermining the authority of the Sanhedrin, so something must be done. Gamaliel reminds the council that this situation has been encountered before and that movements like these have died out on their own because they were not of God. However, if this movement is of God it will not be able to be stopped, and those who do fight against will be found to be fighting against God. So in the end the best thing for the Jewish rulers to do at this point is nothing and see what comes of this movement. The Jewish rulers apparently recognize that Gamaliel’s advice is wise since they take it and simply beat the Apostles and release them. The Apostles however did not listen to the order to not speak in the name of Jesus, but in fact directly disobeyed it and continued to teach and preach in the name of Jesus. If it wasn’t already clear that the Apostles were not going to listen to the orders of the Sanhedrin, it is now. Thanks for reading. More next week. This entry was posted in Acts of the Apostles, Bible and tagged Acts, Acts of the Apostles, Bible, book of Acts, Christianity, God, Holy Spirit, Jesus, religion, theology on September 9, 2013 by SRQTom. 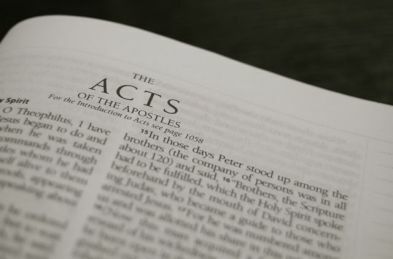 Thus far in the Acts of the Apostles the narrative has primarily been concerned with the formation of the Messianic community that would eventually become known as the Christian Church and the opposition to this community by the Jewish leaders and some of the Jewish people. This theme will resume shortly, but in the meantime we encounter an incident that demonstrates not everyone within this community truly belongs to this community; outwardly they are part of it, but they are not truly part of it because their hearts are different. Before I begin discussing the incident I wish to point out that this is the first time an incident does not fall neatly within a chapter. Chapters and verses were added much later to the Bible and were not present in the originals, nor for several centuries thereafter. Thus when reading the Bible it is best to simply ignore them and focus on the flow of thought within the text because the thought may not be complete until somewhere within the next chapter. This passage is an example of this. 32 And the congregation of those who believed were of one heart and soul; and not one of them claimed that anything belonging to him was his own, but all things were common property to them. 33 And with great power the apostles were giving testimony to the resurrection of the Lord Jesus, and abundant grace was upon them all. 34 For there was not a needy person among them, for all who were owners of land or houses would sell them and bring the proceeds of the sales 35 and lay them at the apostles’ feet, and they would be distributed to each as any had need. 36 Now Joseph, a Levite of Cyprian birth, who was also called Barnabas by the apostles (which translated means Son of Encouragement), 37 and who owned a tract of land, sold it and brought the money and laid it at the apostles’ feet. This incident can be divided into two halves. This is the first half of the incident and describes for us how a particular practice functioning within the newly formed Christian community. If someone owned land or a house, and they desired to sell it, they would sell it and lay all the proceeds from the sale at the apostle’s feet so that it could be distributed to those who were in need. This was not something they were required to do, but was a consequence of the community being “of one heart and soul” and no one claiming anything as his own, but instead recognizing it as belonging to the entire Christian community (v.32). Joseph, also called Barnabas, follows this practice and gives all the proceeds from the sale of the tract of land he owned. But a man named Ananias, with his wife Sapphira, sold a piece of property, 2 and kept back some of the price for himself, with his wife’s full knowledge, and bringing a portion of it, he laid it at the apostles’ feet. 3 But Peter said, “Ananias, why has Satan filled your heart to lie to the Holy Spirit and to keep back some of the price of the land? 4 While it remained unsold, did it not remain your own? And after it was sold, was it not under your control? Why is it that you have conceived this deed in your heart? You have not lied to men but to God.” 5 And as he heard these words, Ananias fell down and breathed his last; and great fear came over all who heard of it. 6 The young men got up and covered him up, and after carrying him out, they buried him. 7 Now there elapsed an interval of about three hours, and his wife came in, not knowing what had happened. 8 And Peter responded to her, “Tell me whether you sold the land for such and such a price?” And she said, “Yes,that was the price.” 9 Then Peter said to her, “Why is it that you have agreed together to put the Spirit of the Lord to the test? Behold, the feet of those who have buried your husband are at the door, and they will carry you out as well.” 10 And immediately she fell at his feet and breathed her last, and the young men came in and found her dead, and they carried her out and buried her beside her husband. 11 And great fear came over the whole church, and over all who heard of these things. The second half of this incident begins with “but.” Most of the time when you see the word “but” used what follows is being contrasted with what was said before it. So in this case these next verses are in contrast to what has been described previously in 4.32-37. In the previous verses we saw that the accepted practice was for someone to lay the entire proceeds from a sale of land or a house at the apostle’s feet. In these verses we see Ananias and Sapphira keep back a portion of the proceeds (vv.1-2). Peter’s words in v.4 are indicative that Ananias and Sapphira were under no obligation to sell the land (“While it remained unsold, did it not remain your own?”) and even after it was sold they were under no obligation to give the proceeds to the apostles (“And after it was sold, was it not under your control?”). Because the money they laid at the feet of the apostles they claimed was the entire price is why Peter asks in v.3, “Ananias, why has Satan filled your heart to lie to the Holy Spirit and to keep back some of the price of the land?” In v.8 Sapphira agrees that the money she and her husband laid at the feet of the apostles was indeed the price of the land. Ananias and Sapphira were both struck dead in judgment for their actions. But why? At first glance it seems like a relatively minor offense to be struck dead for. However if we take a closer look perhaps their offense is not so minor. Recall that at the beginning of this passage the community of believers were of one heart and soul and no one claimed anything for themselves, but considered their possessions to be common property to the entire community. Because they had this attitude they gave all the proceeds from a sale of land to the apostles so that it could be distributed among the rest of the community. This act is in keeping with the attitude of claiming nothing for themselves, but considering their possessions, including their money, to belong to the entire community. So if someone sold some land and laid all the proceeds at the apostles feet so it could be distributed to the rest of the community they were “of one heart and soul” with the community. Barnabas did this, but Ananias and Sapphira did not since they held back some of the proceeds; they were not of one heart and soul with the Christian community. However in selling their land and claiming to have donated all the proceeds from the sale to the apostles they claimed to belong the Christian community. Ananias and Sapphira wanted to be considered as part of the Christian community, but demonstrated by their actions that they were not. They were not struck dead in judgment because they sinned, but because they were not of one heart and soul with the rest of the community and were a threat to it. In the previous passage we saw an example of God’s protection of His Church from the outside threat of the Sanhedrin. Here we see an example of God’s protection of His Church from the inside threat of Ananias and Sapphira. Were it not for God’s protection over His Church it would not have survived to this day. And should God cease to protect His Church, His Church will cease to exist. This entry was posted in Acts of the Apostles, Bible and tagged Acts, Acts of the Apostles, Bible, book of Acts, Christianity, God, Holy Spirit, Jesus, religion, theology on September 3, 2013 by SRQTom. 13 Now as they observed the confidence of Peter and John and understood that they were uneducated and untrained men, they were amazed, and began to recognize them as having been with Jesus. 14 And seeing the man who had been healed standing with them, they had nothing to say in reply. 15 But when they had ordered them to leave the Council, they began to confer with one another, 16 saying, “What shall we do with these men? For the fact that a noteworthy miracle has taken place through them is apparent to all who live in Jerusalem, and we cannot deny it. 17 But so that it will not spread any further among the people, let us warn them to speak no longer to any man in this name.” 18 And when they had summoned them, they commanded them not to speak or teach at all in the name of Jesus. 19 But Peter and John answered and said to them, “Whether it is right in the sight of God to give heed to you rather than to God, you be the judge; 20 for we cannot stop speaking about what we have seen and heard.” 21 When they had threatened them further, they let them go (finding no basis on which to punish them) on account of the people, because they were all glorifying God for what had happened; 22 for the man was more than forty years old on whom this miracle of healing had been performed. Despite the Jewish leaders recognition of Peter and John as being uneducated these educated leaders can offer no reply or rebuttal to what has been said. The reason is found in v.16: they recognized that a great miracle had taken place through them and it was evident to everyone and could not be denied. In fact the only response the Jewish leaders can offer at this point is to tell Peter and John to no longer speak or teach in the name of Jesus. To which Peter and John respond: it is not right to listen to man over God, so we will not stop talking about what we have seen and heard because what we have seen and heard is from God. In response the Jewish leaders threaten Peter and John further and then release them since the miracle they performed was too great (the man on whom it was performed was 40 years old) and the response of the people too overwhelming for them to dole out any actual punishment. The response of the Jewish leaders here is indicative of a group of people who have been caught off guard by something they did not expect. The Sadducees in particular did not expect two uneducated and untrained fisherman to heal a man who had been unable to walk for the entire 40 years of his life and then turn around and counter one of their chief teachings by proclaiming that Jesus, who was crucified, dead, and buried had risen from the dead and it was through him that this man had been made well. Presumably the Jewish leaders thought that by taking down the leader of the group, Jesus, the rest of the group would disperse and the movement would ultimately come to nothing (more on this in chapter 5). However this is not what is happening, and the Jewish leaders seem surprised. And the peoples devise futile things? 27 For truly in this city there were gathered together against Your holy servant Jesus, whom You anointed, both Herod and Pontius Pilate, along with the Gentiles and the peoples of Israel, 28 to do whatever Your hand and Your purpose predestined to occur. 29 And now, Lord, take note of their threats, and grant that Your bond-servants may speak Your word with all confidence, 30 while You extend Your hand to heal, and signs and wonders take place through the name of Your holy servant Jesus.” 31 And when they had prayed, the place where they had gathered together was shaken, and they were all filled with the Holy Spirit and began to speak the word of God with boldness. The quotation here is from Psalm 2.1-2. In the portion of the Psalm that is quoted here we have a group of people (Gentiles) opposing and conspiring against the Lord’s Christ (or “anointed one”). Peter recognizes the situation described in the Psalm as being the same as the current situation where there is a group of people (Herod, Pontius Pilate, and Jewish leaders) opposing and conspiring against the Lord’s Christ (Jesus). Since Psalm 2 ends with the promise that the Lord’s “anointed one” will triumph over those who have gathered together to oppose him (Psalm 2.4-9) Peter then asks God to grant that he (Peter) and all those with him (“Your bond-servants”) would speak God’s message with confidence while God himself performs signs and wonders through Jesus. In other words, Peter is saying that Jesus is the Lord’s anointed one in Psalm 2 and asks God to grant the promise of Psalm 2, that those opposing the anointed one be defeated. There is also another phrase in here which I want to note, since it occurs multiple times throughout the book: “filled with the Holy Spirit.” This phrase has occurred in 2.4; 4.8, 31 so far in the book and is usually followed by someone, or a group, proclaiming God’s message despite any opposition that might be encountered. This proclamation of God’s word despite opposition is a theme that will be encountered later on in the book as well. At this point we also have another of the major themes setup which is going to play out through the rest of the account: the opposition of the Jewish leaders and people to the Holy Spirit indwelt Messianic community which would later be recognized as the Christian Church. But really this is just a continuation of the theme that runs throughout the entire Bible: God is in the process of executing a plan to redeem humanity and some are opposing that plan of redemption. That’s all for today folks, thanks for reading. This entry was posted in Acts of the Apostles, Bible and tagged Acts, Acts of the Apostles, Bible, book of Acts, Christianity, God, Holy Spirit, Jesus, religion, theology on August 26, 2013 by SRQTom. When we last left off Peter and John had just performed a miracle in the Temple by making a man who had born lame able to walk. This attracted a crowd of people, presumably mostly Jewish, to which Peter delivered a second speech proclaiming to his fellow Jews that Jesus was the Messiah they had been waiting for, so they should repent of their lack of faith in Jesus as Messiah and join the community that He established “in order that times of refreshing may come from the presence of the Lord;” (Acts 3.19). We did not, however, learn of the reaction of the people to Peter’s speech; that is reserved for the following verses, the first part of which will be covered in this post. As they were speaking to the people, the priests and the captain of the temple guard and the Sadducees came up to them, 2 being greatly disturbed because they were teaching the people and proclaiming in Jesus the resurrection from the dead. 3 And they laid hands on them and put them in jail until the next day, for it was already evening. 4 But many of those who had heard the message believed; and the number of the men came to be about five thousand. Following Peter’s Pentecost speech there is no mention of any opposition to his words, but here, for the first time in the narrative, opposition is encountered. The Sadducees were a sect of Jews who taught that there was no resurrection (Matthew 22.23; Mark 12.18), so naturally they would be disturbed if someone was proclaiming that someone rose from the dead. Not only did this challenge one of their defining teachings, but it also was a threat to their power as well since they were members of the Sanhedrin, the supreme court of ancient Israel to which all questions of the Jewish faith (e.g. the Law; Law of Moses) were finally put; one of their defining teachings being proven false threatens their credibility to accurately interpret and decide on matters of the Jewish faith. So in order to keep their credibility and power they have Peter and John put in jail. However Peter’s words had already had an effect on the people since “the number of the men came to be about five thousand.” The word translated “men” here is the Greek term andron, which usually refers to men or husbands; so the number of male Christian believers is now at about 5,000, and the total number of believers presumably higher with women and children added in. Often the Jews, when discussed in relation to Biblical events, get a bad rep, however a significant number of them did come to recognize Jesus as the Messiah and the early Christian community was primarily composed of Jewish converts. Let’s not forget that. Annas and Caiaphas are mentioned previously in Scripture as presiding over Jesus’ trial before the Sanhedrin (specifically mentioned in Matthew 26.57-68 and John 18.12-28), so they are no strangers to opposing Jesus and His followers; in fact they were part of the group that persuaded Pilate to have Jesus crucified. Peter is certainly aware of who these men are and what their feelings are towards Jesus and His followers, but that doesn’t dissuade him from continuing to proclaim what he has consistently proclaimed: that Jesus Christ was crucified, dead, buried, and rose again and there is salvation in no one else; He is the Messiah that we have been expecting and His kingdom has been established. Thus far in the narrative Peter has given three speeches and each speech has been delivered to the same audience: Jews, and had a consistent message: Jesus the Nazarene is the prophesied Messiah you have been waiting for, so repent of your lack of faith in Him and join the community He established. Even when faced with a group that he knew to be hostile towards his message he still did not change it, but proclaimed it faithfully. His faithfulness was not due to him being logically convinced of a theological system of beliefs, but rather because he had witnessed the events he was proclaiming and could not deny his experience. I have mentioned previously that Christianity is based on the historical event of Jesus’ death, burial, and resurrection, not on any particular system of theology; the theology can fall away and be proven false, but as long as Jesus rose from the dead Christianity is true. I say this is the basis because this is what the Apostles themselves claimed as the basis of the faith, and we have seen Peter state that basis three times now in the Acts of the Apostles. As Christians the basis of our faith should be this basis as well; Jesus has risen and defeated death and through Him we have eternal life and salvation. In the Christian culture I was raised in I found this basis unfortunately neglected and not proclaimed to the extent I believed that it should have been. To me it seemed that more effort was devoted to defending particular doctrinal or theological beliefs (though this certainly does have a place), and not enough to proclaiming and reminding me of Jesus’ resurrection and the implications of that event. This entry was posted in Acts of the Apostles, Bible and tagged Acts, Acts of the Apostles, Bible, book of Acts, Christianity, God, Holy Spirit, Jesus, religion, theology on August 19, 2013 by SRQTom. In the previous passage (3.1-10) Peter and John went to the temple to pray and upon finding a man who had been lame from birth, through the power of Jesus, made him able to walk. The people at the temple recognized the man and were amazed at what had happened to him. In this passage Peter addresses the crowd that had gathered around him and John. 11 While he was clinging to Peter and John, all the people ran together to them at the so-called portico of Solomon, full of amazement. 12 But when Peter saw this, he replied to the people, “Men of Israel, why are you amazed at this, or why do you gaze at us, as if by our own power or piety we had made him walk? 13 The God of Abraham, Isaac and Jacob, the God of our fathers, has glorified His servant Jesus, the one whom you delivered and disowned in the presence of Pilate, when he had decided to release Him. 14 But you disowned the Holy and Righteous One and asked for a murderer to be granted to you, 15 but put to death the Prince of life, the one whom God raised from the dead, a fact to which we are witnesses. 16 And on the basis of faith in His name, it is the name of Jesus which has strengthened this man whom you see and know; and the faith which comes through Him has given him this perfect health in the presence of you all. There are a couple of interesting contrasts I wish to point out in this passage. Both of these are being contrasted with the first part of v. 13, “The God of Abraham, Isaac and Jacob, the God of our fathers, has glorified His servant Jesus…” In v. 14 the Jews decided to exchange the “Holy and Righteous One” for a murderer. * Instead of worshiping, praising, or otherwise exalting Jesus the Jews decided instead to set a guilty murderer free rather than the innocent Jesus when they were given the opportunity. Not only did they not set Jesus free when given the opportunity, but they even condemned him to crucifixion (v. 15)! Rather than accept the life that the “Prince of life,” Jesus, offered them they not only rejected him, but had him killed so that no one could accept the life he offered. This of course didn’t work as God, the God of Abraham, Isaac, and Jacob; the God of the Old Testament; Yahweh (YHWH, Jehovah); the Jewish God; raised Jesus from the dead. Peter continues his speech by granting to the Jews that they may not have known what they were doing at the time when the crucified Jesus. However Peter does believe, as I stated earlier, that they should be aware of what they did by now. He argues that Jesus’ death and suffering was predicated by the prophets. Isaiah 52.13-53.12 predicts the suffering and eventual death of the Messiah and Peter is arguing here that Jesus was the one who fulfilled this prophecy. Peter continues his argument, that since Jesus fulfilled the suffering and death that was predicted of the Messiah that they should repent so that times of refreshing will come and the restoration of all things begin. The prophets prophesied that Israel would go into exile for not following the covenant that had established between them and God; this happened during the Babylonian (586 B.C.) and Assyrian (722 B.C.) captivities. Following these captivities the prophets prophesied that there would a restoration when Messiah came, but it first required repentance from Israel. So Peter is exhorting his fellow Jews and saying to them, again, that the Messiah they have been waiting for has come, so they should repent of their lack of faith in Him so that the prophesied restoration may come about; God made this covenant with you (Israel) and your ancestors, that through you the Earth would be blessed, so enter into this blessing so that the world may be restored. And if you’re curious, Moses’ prophesy referred to in vv. 22-23 is found in Deuteronomy 18.15-19. The statement that God made to Abraham quoted in v. 25 is found in Genesis 12.1-3. Thus far in the Acts of the Apostles, following the coming of the Holy Spirit, we have seen two sermons by Peter directed towards his fellow Jews arguing that Jesus is the Messiah they have been waiting for. Following his first sermon we saw about 3,000 Jews join the Christian community and be baptized. Will his audience here respond in the same fashion? Wow, look at that, only took me two posts to get through an entire chapter this time! * The incident being referred to here can be found in Matthew 27.11-26; Mark 15.1-15; Luke 23.1-25; John 18.28-40. This entry was posted in Acts of the Apostles, Bible and tagged Acts, Acts of the Apostles, Bible, book of Acts, Christianity, God, Jesus, Messiah, prophecy, religion, theology on August 2, 2013 by SRQTom. At this point in Luke’s account Peter has just finished his speech to his fellow Jews attempting to persuade them that the Galileans they see are not drunk, but are filled with the Holy Spirit as was prophesied by the prophet Joel. As a result about 3,000 of those who heard him recognized Jesus as the Messiah and joined the Christian community. Now Peter and John were going up to the temple at the ninth hour, the hour of prayer. 2 And a man who had been lame from his mother’s womb was being carried along, whom they used to set down every day at the gate of the temple which is called Beautiful, in order to beg alms of those who were entering the temple. 3 When he saw Peter and John about to go into the temple, he began asking to receive alms. 4 But Peter, along with John, fixed his gaze on him and said, “Look at us!” 5 And he began to give them his attention, expecting to receive something from them. 6 But Peter said, “I do not possess silver and gold, but what I do have I give to you: In the name of Jesus Christ the Nazarene—walk!” 7 And seizing him by the right hand, he raised him up; and immediately his feet and his ankles were strengthened. 8 With a leap he stood upright and began to walk; and he entered the temple with them, walking and leaping and praising God. 9 And all the people saw him walking and praising God; 10 and they were taking note of him as being the one who used to sit at the Beautiful Gate of the temple to beg alms, and they were filled with wonder and amazement at what had happened to him. While the events of this passage are fairly straightforward I do want to point out a couple of things about it. First, the word “now” at the beginning of verse 1. When an attempt is made to chronologically layout the events of a Biblical book, or books (e.g. the Gospels), one of the criteria used to determine where a particular event falls chronologically is if any progression of time is given from the previous event. So if an account has an event A and then event B follows A in the account and begins with something like “following this” we know that chronologically event B follows event A. However, if an account has an event C and then event D follows event C in the account, but begins with something like “now” it gives us no indication as to where event D falls chronologically in the account; even though it follows event C in the account it may well have occurred before event C chronologically. So if we were to attempt a chronology of the events of the Acts of the Apostles it would begin with the events of chapter 1, and following that would be chapter 2, but when we came to chapter 3 we would put it off to the side until we had gone through the rest of the events and determined as much chronologically as we could from them before attempting to insert these events into the chronology. This leads me to an important point regarding Bible study: the order of events as related in a narrative is not necessarily indicative of their chronology. The authors of Scripture were not primarily concerned with recording an exact succession of events as a biography or history might, but rather were using the events to make point; they were concerned with showing what the events meant, not recording the exact order of the events. So when we read a Biblical book we should be linking the different events through what they reveal: about the people they are describing, and also about God. The Scriptures tell a story and it is grasping and understanding this story and our place in it that is the goal of Bible study, not the organizing and memorizing of facts and events. This is why, I think, the authors of Scripture composed their accounts they way they did, because they were concerned with showing people how they should live as a result of these events. If their primary concern were to have the people simply know events a chronological account would have sufficed, but I do not believe this to have been their primary concern. Second, a man who had previously been unable to walk was made to walk. The lame walking was prophesied by Isaiah (Isaiah 35.6a) as one of the events that was to occur during Israel’s restoration under Messiah. Jesus has already been identified by Peter as the Messiah (see ch. 2), and here we see Jesus identify himself as Messiah by healing a lame man through Peter. This is now the second indication to Israel that the kingdom they are expecting to be inaugurated by the Messiah has come and is present among them. Also, note where this event took place: in the temple. This is important because it identifies for us that the audience of Peter’s next speech is primarily, or entirely, Jewish. And we will look at Peter’s speech in the next post. This entry was posted in Acts of the Apostles, Bible and tagged Acts, Acts of the Apostles, Bible, book of Acts, Christianity, God, Jesus, theology on July 29, 2013 by SRQTom.